Today I am sharing the card that was published in the March/April issue of Paper Crafts Magazine. It's funny, The Hubbums had picked this one as his favorite of all the cards I submitted for that call even though I wasn't so sure since it was a bit different for me. I guess it worked out in the end! YAY! I just LOVE that peacock feather and the metal frame makes me happy, too. I have a couple more of those, I should totally use them. Just sayin'. The doily is actually a portion cut from a larger crocheted piece that I found in an antique shop. It was damaged, so I felt NO guilt cutting it up! LOL! The sentiment is from the Heartfelt Sentiments set by Unity. Don't you just love how peacock feathers look like eyes? Big, gorgeous, Hollywood, eyes! I love it!!! They are just bold and beautiful! Speaking of bold and beautiful...I have a confession. This morning Vogue came on right as I pulled in. I totally sat in the parking lot just to listen to the rest of the song. Just sayin'. And I'm eating Jelly Beans for breakfast, but at least I had a Chobani first! It's FRIDAY!!! Make it a GREAT one, K? K. Thanks. Bye now. Oh wow! LOVE the peacock feather!! Beautiful card! congrats on the pub! Beautiful card, I love all of the found items on it! oh, this is just stunning! It is very unique~I can so see why they published it~fantastic work jen!!! I did see this...congratulations on your publication...this is so amazing..
Congratulations - this is a beautiful and unique design. Congratulations! I saw this in papercrafts! You are so creative! Great card! I would say your hubbums has an eye for these things...... congrats on the card! The peacock feather is great! I've been collecting Tulip's feathers but hers are teeny tiny. Oh - so PRETTY!!! I saw this in the issue - and loved it! Beautiful card. I wouldn't want to give it away. Great card. I can see why it was published. Congratulations babe!! 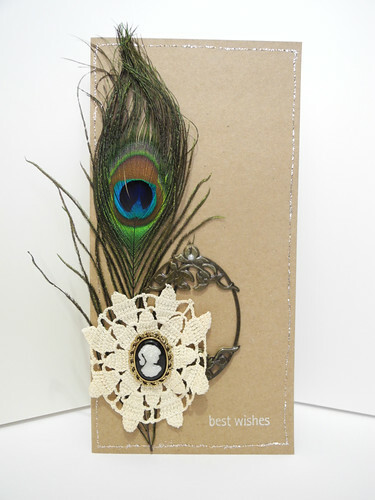 LOVE this card...love feathers of any kind. There are so many great things about this card. It was published. Good for you. I knew I had seen it before. I subscribe to Paper Crafts. It has a cameo, which I love and it also sports a real doilly. Thansk for the inspiration. I love all of the greens and blues in peacock feathers. Your card reminds me of the fancy-shmancy hats ladies used to wear! Great and huge congratz on being published there! Outrageously gorgeous card! That's a beauty!!!! And hey, don't be embarrassed about sitting in the car listening to the son. Now if you'd told us you got out and struck a pose and did the dance in the parking lot... that'd be a whole different thang. Wow great card I love the cameo that is so petty! that feather adds such a GORGEOUS touch! It is a lovely, card! Have a great weekend! Fabulous! Love the contrasting textures and congrats on the publication! Congrats on being published! 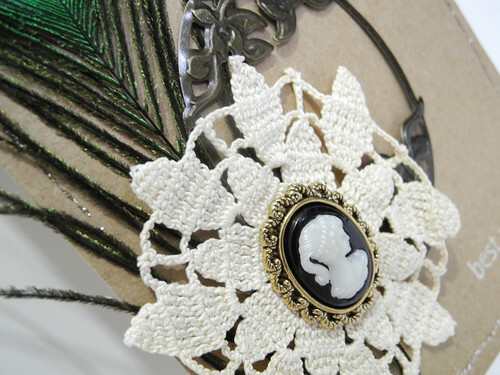 Love the feather and doily. Nice touch! beautiful card, huge congratulations on being published, will have to go get the magazine now! WOW! It's wonderful...so exciting to be published!! AMAZING card! Congrats on the publ. but no wonder with such a beauty! LOVE it!